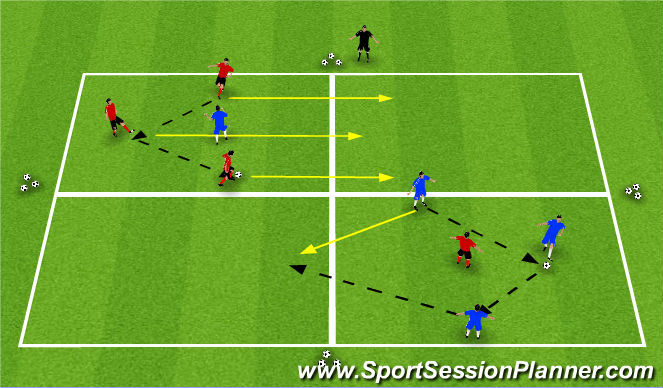 3vs1 play must be seen as a game and not as a drill, exercise or an activity to keep players busy. 3vs1 allows players to become comfortable on the ball with minimal pressure to make decisions. Each touch on the ball encourages players to make decisions because each time it is a different problem to solve as there is pressure from the defender. 3 players inside 1 area, keep possession until all 3 attackers have touched the ball. Once they have they are to dribble/pass into the opposite area. Keep possession, by passing, dribbling & shielding the ball from the defender. If defender wins possession, s/he must dribble out of the area or shield it for 3 seconds. Change over with player who lost possession.